The new Super Smash Bros. update for the Wii U version of the game adds nine new 8-player smash stages, and six new "omega" stages. An update has just gone out for the Wii U version of Super Smash Bros., and as well as the usual bug and balance fixes, nine "new" maps have been added to the game's 8-player smash mode, as well as six new "omega" stages for the regular mode. I put "new" in quotation marks, because technically these maps already existed in the game's regular 4-player smash mode, but they have been updated, and had some hazards and events removed, for the game's chaotic 8-player mode. 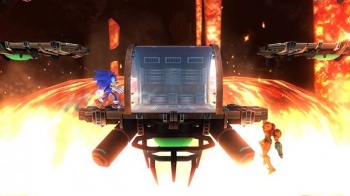 As for the omega stages, they are just flat, single-platform "final destination" versions of the game's regular stages. For me and my friends, 8-player smash has become the new standard game mode, as we aren't the real "1v1 final destination no items Fox only" type smash players, and there are usually more than four of us hanging out at once. So, the addition of new maps for the mode is a very welcome one, as it is lacking a bit in variety at the moment. It's, of course, also nice to see Nintendo giving this content away for free, whereas less scrupulous publishers would probably be charging us up to $10 for it. The update should automatically download the next time you boot up the game, provided you have an active internet connection.